In 1963, the last of the Freedom Fighters are hoping the Resistance can vanquish the Third Reich. They’ve already lost team members and are moving toward their last ditch effort toward revolution. Unfortunately, their dreams are cut short as they are ambushed, leaving the team decimated in body, but not in spirit. Five decades later, Nazis still reign in America, but to their shock, Freedom may just get another chance. Freedom Fighters is admittedly difficult for a few reasons. Considering America’s current political climate, the story hits close to home as a remnant of a past we too easily forget, a present that is forebodingly similar, and a future that could mirror what we see in each page. These kinds of stories, where vehemently hostile oppressors gain a win at the outset, have to be handled with care. Luckily, this story doesn’t veer into the territory of legitimizing fascism, though there is some slight irony through different plot elements. Robert Venditti in some ways turns a story of Nazis and propaganda on its head. We see a past and future where the Third Reich has been able to take over, creating a framework where, much like how current systems of oppression operate, hatred is normal and therefore people may not always question it, even if there is a sense of immediacy to certain consequences. Venditti makes it abundantly clear that the villains have, to some extent, gained a victory, but that the victory will be challenged by those who truly seek justice. This comic reminds me of how and why these stories existed around the 1920s-1940s as a means of resistance and nationalism during times of international conflict. What I find interesting is how something like the Pledge, which has its own paradoxically oppressive roots, is used as an oath to uphold justice, whereas today it has become an increasingly unsettling vestige of the dangers of the nationalism that has been used to bolster support for American ideals. 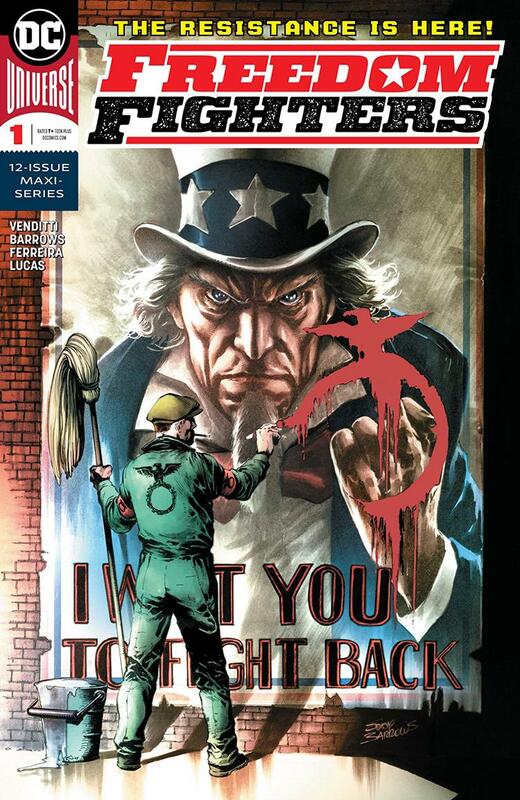 I’m not sure if this effect was intentional, but Venditti has written a story about challenging very apparent evil while also holding up a mirror to America. Eddy Barrows captures not just the disorder of America under siege, but the deceptively idyllic environment decades later. The tension within every panel is palpable, even as things look relatively ‘normal’ as we arrive to the story’s current events. Barrows adds a slight element of horror the characters and environment through exaggerated postures and expressions. This effect amplifies the already intense feelings through the comic, and also visually expresses the significant evil that the Freedom Fighters have to rise against. Eber Ferreira’s inks are heavy. One thing I appreciate about the inking for Freedom Fighters is that it presents an atmosphere that doesn’t truly feel safe. Even though in the latter parts of the issue things seem as though there is a lack of chaos, we quickly see through various aspects of storytelling that fifty-five years later, things really aren’t better and order is not an indication of peace. Every character still feels like they are steeped in terror or fear, whether as agents or recipients, and Ferreira is a significant contributor. Ferreira’s talents are on their best display with the Plasstic Men. These sinister and oddly shapen beings are monstrous, and the density put into their images makes them that much more terrifying. Adriano Lucas’ muted tones encapsulate the dire straits of America in Earth-X and the building sense of hopelessness against a villainous power. Through most of the issue, even colors that would ordinarily be bright are rendered inert. Uncle Sam’s red, white, and blue are subjugated under the shadowy environment that surrounds him. Later, under bright skies, it feels as though the intensity is sapped from every color. Lucas showcases an interesting contrast, however, when Uncle Sam passes on his spirit and the new Freedom Fighters emerge. There’s an excellent scene toward the end where the citizens seem as though there is a spark that ignites in them upon seeing their heroes again, and for the first time we get a true sense of clarity with color. I’m curious as to whether this may change as the series presses on, so I will definitely be paying attention to the colorwork in this comic. Just like creators must take caution when crafting these kinds of narratives, so must we be careful not to ascribe meaning to media without something to back it up. So, when reading Freedom Fighters I do see the age old story of triumphing over evil, yet I also see how this story exists in relation to current, and, quite frankly, past, events. The constant fear is evident not just in what transpires through the story, but also in its visual representation, from distorted images to subdued colors. With this being the first issue, especially with a rather surprising and hopeful ending, I have no idea what’s going to come in the following eleven. Still, I’m curious to see what other messages pop up and I wonder what we will be able to glean from them as a society.